The Challenge is organized by Indian Road Safety Campaign (IRSC) in collaboration with MORTH and UNITAR under iSAFE’18: National Level Road Safety Championship for Students, was designed to give participants the opportunity to use their creativity in producing an animated video on ‘road safety’ which is a major challenge that impacts the safety and security of youth and their ability to contribute to the development of their communities. It’s a big scale national level competition and opens for everyone interested! YES, EVERYONE and ANYONE! You will get a chance to present your work in front of many respectable delegates. 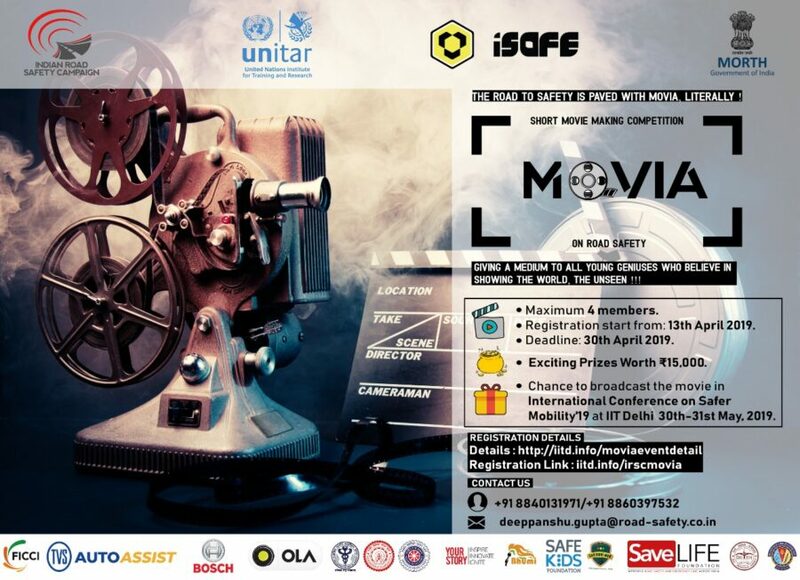 A Chance to broadcast the movie in Road-safety International Conference in association with UNITAR and MoRTH at IIT Delhi 30th-31st May 2019. The best three movies will receive prizes and merit certificate and all participants will receive the certificate of participation. Click Here for full details and for official website, click here.